Introducing Zelle® – a fast, safe and easy way to send money in minutes1 to your friends and family, right from the Level One Bank mobile app. 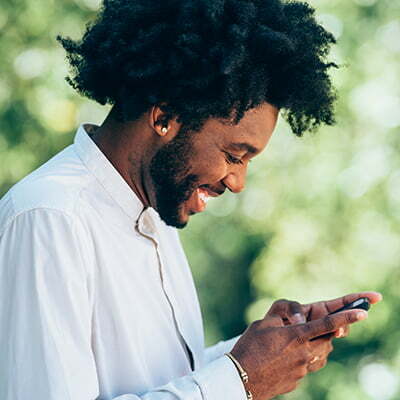 When you use Level One Bank mobile banking app, Zelle is already available on your phone. Zelle makes it easy to send or receive money from people you trust – no matter where they bank2. Find Zelle here in your Level One Bank app. Send or receive money right from your Level One Bank app. Find Zelle in your Level One Bank app. Log in and go to your menu. Scroll down until you see “Send Money with Zelle®“. Then, enroll with your U.S. mobile number or email address to get started. Select a contact or type in the U.S. mobile number or email address of the person you’d like to send money. Remember to only send money to people you know and trust. Enter the amount you’d like to send and, if you want, add a note. Tap send and you’re done. Send your friend a request and a way to pay you back directly with Zelle. Just enter their U.S. mobile number or email address, the amount they owe you, and hit send.3 When they respond, the money will appear in your Level One Bank account. Send money in the moment. Don’t worry about covering your friends. Zelle lets you request money and get paid back quickly. Use Zelle to get rent without calling a house meeting. Zelle is an easy, fast and safe way to send money directly between almost any bank account in the U.S., typically within minutes*. With just an email address or U.S. mobile phone number, you can send money to people you know and trust, regardless of where they bank*. *To receive money in minutes, the recipient’s email address or U.S. mobile number must already be enrolled with Zelle. Must have a bank account in the U.S. to use Zelle. What types of payment can I make with Zelle? Zelle should not be used for the purchase of goods. Neither Zelle nor Level One Bank offer a protection program if you do not receive what you paid for or the item you receive is not as described or as you expected. There is a minimum transaction amount of $5. There is a daily transaction limit of $2,000 and a rolling 30 day period limit of $5,000. A user can only send money a maximum of 15 per day and 30 per month. A user can only request money a maximum of 10 per day and 30 per month. What if Zelle doesn't show up in my Level One Personal Banking App? You many need to login into online banking and enroll in Bill Pay. Once you enroll in Bill Pay, you should be able to access Zelle in your Level One Personal Banking App. Enroll in Zelle and get your money moving. Download the Zelle App (iOS) Opens a New Window. Download the Zelle App (Android) Opens a New Window. 1 Transactions typically occur in minutes between enrolled users. If a recipient is not enrolled with Zelle, it could take 1 to 3 business days to receive the money once the enrollment is completed. 3 To send payment requests or split payment requests, the U.S. mobile number being used must already be enrolled in Zelle.